No investment analysis would be complete without an evaluation of life span for commercial building components. These are truly unique for every commercial property and greatly depend on the quality and history of its individual components. Below, we take a look at the most important building features and typical life expectancies. The building itself is the one of the most significant features. How was the building constructed? What methods were used in its design and construction? What materials were selected? How have other similar buildings held up to environmental and usage factors? Buildings don’t generally have a precise life span given that many have already existed for hundreds of years. However, some building structures require more maintenance than others to extend its useful life. Internal building materials normally have shorter life spans than the structure itself. From drywall to wood, caulking, and paint, most internal building components require repair or replacement over time. Some may need attention every 5 years whereas others may last closer to 20 years. The history of past maintenance can help you estimate required future maintenance. Major systems such as HVAC, roofing, and elevators have more predictable life spans, as indicated by their manufacturers. Most HVAC systems last 15 to 30 years. Roofing materials can range from 15-30 years, depending on the design and quality. Water heating and filtration systems are closer to 10 years. Plumbing systems may last 50 years but with repairs required along the way. Furnishings have probably the shortest life spans of all building components. They are also most susceptible to wear and tear. From flooring to cabinetry and fixtures, the more a building is occupied and used, the sooner these items will need replacement. Selecting quality materials that hold up well against wear and tear require a larger up-front investment but may minimize future installation and repair costs. 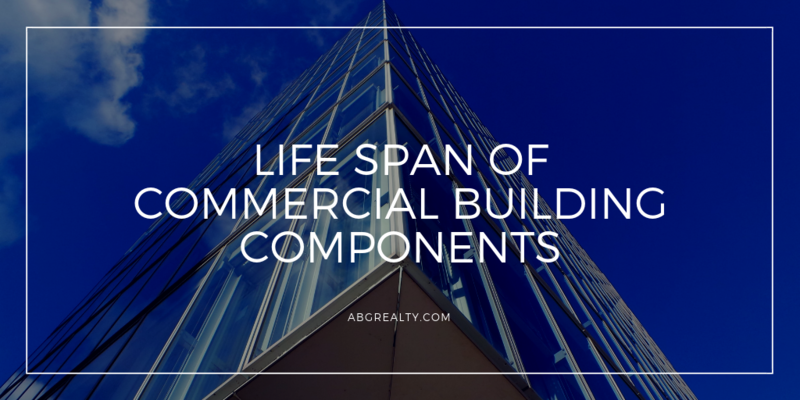 Estimating the life span for commercial building components can provide investors with a clearer picture of required capital investments, operating expenses, potential rental income, profitability, and resale value. Industry knowledge and experience are essential to accurate estimates, so be sure to enlist the help of professionals with the right expertise. Contact ABG Realty for additional information on this and other commercial real estate topics.